Chemical, steam, hydrocarbons, pulp & paper, etc. Slade 3300G has the same benefits of 3300C, with the additional strength of carbon reinforced corners. Designed to perform as a mechanical seal, leak free. Constructed of high tensile strength carbon and expanded graphite to provide the needed lubrication. Therefore, no leakage is required either to cool or lubricate the packing. Leak free operation will extend run time and shaft sleeve life. Due to its patented construction of natural, expanded graphite yarns, Slade 3300G turns the stuffing box into a heat sink, conducting heat away from the shaft, in many applications, eliminating expensive leakage previously needed to cool the stuffing box. Slade Packing can be run flush free in most applications. If media has particulate contamination, a very mild flush should be all that is required to keep solids out of the stuffing box. Worn shafts and sleeves can easily be sealed. When properly installed, Slade packing will conform to the geometry of the stuffing box and shaft. Therefore Slade can seal most worn sleeves. 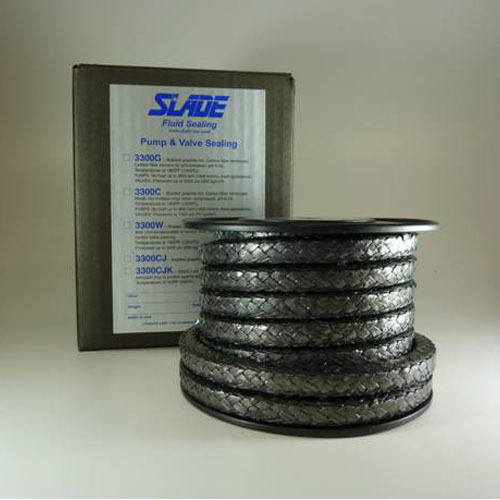 Whereas most pump packings are largely abrasive fibers with added lubricants that can be squeezed, washed or cooked out, Slade packing utilizes the self-lubricating qualities of the very best natural, exfoliated graphite.